We offer a wide range of rugs, which are available in various colors & designs. These are colorful floor covering, which are crafted in vibrant colors with intricate designs. These rugs are manufactured from fine fabrics with royal color combinations and elegant designs. Furthermore, our range is offered at competitive prices to the clients. Some of our range of rugs include bath rugs and shag rugs. 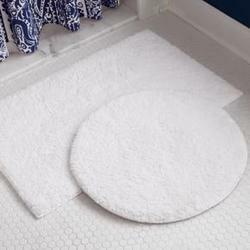 We present a wide gamut of Shag Rugs that is highly attractive and is extremely soft to touch. The shag rugs have a capacity to add charm to the decor of the room where it is placed. These shag rugs are stylish and extremely elegant as these are available in various color combination and designs. We offer these rugs at most competitive prices. We offer an enchanting range of Bath Rugs that is finely crafted with intricate designs. These are designed using premium quality material like water absorbent pure cotton and fiber. Furthermore, these can be placed on the entrance of the bathroom, giving a blend of utility and design. These are available in various patterns and colors so that is can be matched with the other home furnishing thus providing and elegant look to the home.